For the first post of the ‘featured artwork’ category of the ‘art in the periphery’, the three drawings reproduced here, by French artist Pierre Lélu (1741-1810) (1), may seem like an odd choice. Nothing about their country of origin, genre or style seem ‘peripheral’. 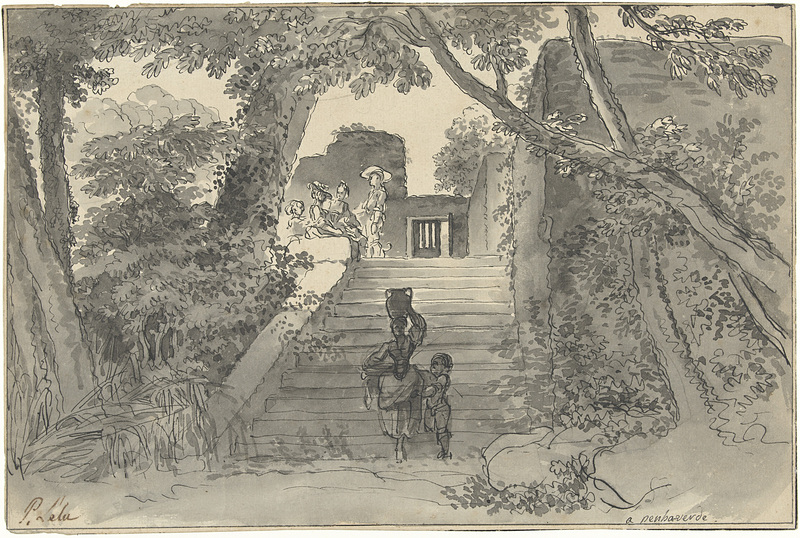 Nevertheless, in a country where no indigenous tradition of landscape painting existed until the nineteenth century as I have elsewhere argued (2), and where landscape was systematically ‘discovered’ as a subject worthy of representation by foreigners (often French, like Lélu), these three drawings can be used to illustrate the complex ways that center-and-periphery relationships might function, in the realm of art. Lélu came to Portugal in all likelihood in August 1773, as secretary of the French ambassador Clermont d’Amboise (3). If he stayed for the length of the latter’s appointment to the court of Portugal, then he must have left with him in October 1774. He traveled though to Spain in 1773-1774, where he made topographical sketches for Lord Grantham, as well as pencil portraits of him (4). His short stay is more likely responsible for the fact that these drawings or any other activity he might have undertaken while in Portugal, seem to have sunk into oblivion (5). Drawings from Sintra dating from this period are relatively rare (6). 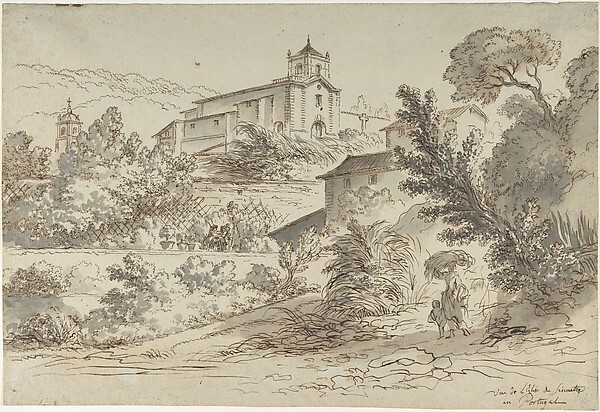 A quick sketch of Sintra’s hilly landscape by Alexandre Jean Noël (1752-1843), from a sketchbook dating from 1780, is preserved in the Museu Nacional de Arte Antiga in Lisbon. Its sweeping vista is not unlike the topographic drawings produced during various scientific expeditions. Noël would have undoubtedly been familiar with their visual language, as well as compositional structure, since he accompanied the astronomer Jean Chappe who set out to Mexico to observe the transit of Venus in 1769, and was responsible for documenting anything that might appear of interest for the expedition. Noël’s most recognisable view of Sintra, a 1795 aquatint representing Monserrate, the country seat of the rich merchant Gerard de Visme, still retains the memory of the 1780 sketch. Lélu’s drawings are very different. He appears to have concentrated his efforts in the representation of the lush foliage, creating a vision of nature that accommodates different social classes as picturesque motifs, without disrupting neither the scenery nor the hierarchical organisation implied in its depiction. At a time when Portugal’s landscape was being transformed into images by various foreign artists (mostly French, some British), it is not so much the rarity of an early representation of a Sintra landscape that is striking, but its transformation into a rococo pleasure garden. Lélu followed the pictorial conventions of eighteenth-century French painting while portraying a Portuguese landscape. What are the implications of that transposition of visual vocabulary? What would have been the significance – and consequences – of these images, produced by outsiders looking in? And what would these have meant to younger generations of Portuguese artists when they were called upon to create their own versions of their country’s landscape? I hope that Lélu’s drawings can serve as a starting point for this discussion. (1) For biographical information on Pierre Lélu, see Vialart Saint-Morys, “Notice sur Pierre Lélu”, in: Magasin encyclopédique, ou Journal des sciences, des lettres et des arts, rédigé par A. L. Millin, vol. IV, 1810, pp. 323-328; see also Jules Renouvier, Histoire de l’art pendant la révolution, considéré principalement dans les estampes, Paris 1863, pp. 135-137. There is also a recent master thesis, that I have been unable to consult: Ophélie Lopez, “Pierre Lélu, dessinateur”, mémoire de recherche, Université Paris IV Sorbonne, 2010. (2) Paper on ‘Painting Portuguese Nature’, delivered in the Crossing Borders international workshop (25-29 September 2014, Lisbon). Publication forthcoming. (3) Vialart Saint-Morys, op. cit., mentions that the artist traveled extensively in the service of the marquis from 1767 onwards, in various European courts. For the dates of Clermont d’Amboise’s appointment to the court of Portugal, see Visconde de Santarem, Quadro elementar das relações politicas e diplomaticas de Portugal com as diverse potencias do undo deeds o principio da Monarchia Portuguese ate os nossos dias, vol. 8, Paris 1853, pp. VIII-XII. Nevertheless, the book Étrennes de la noblesse, ou état actuel des familles & Nobles de France, & des Maisons & Princes Souverains de l’Europe, published in Paris in 1771, already mentions d’Amboise’s appointment, as having happened in June 1767. This would push the arrival of both men back by six years. Further research will be needed to clarify this point. (4) Enriqueta Harris, Complete Studies on Velázquez, Centro de Estudios Europa Hispánica, 2006, p. 297. (5) A quick search in the traditional sources where the memories of foreign artists who worked in Portugal have survived (Cyrillo Volkmar Machado, Sousa Viterbo) has not yet revealed any clues. (6) Agostinho Rui Marques de Araújo, “Experiência da natureza e sensibilidade pré-romântica em Portugal. Temas de pintura e seu consumo (1780-1825)”, 2 vols, PhD dissertation, Centro de História da Universidade do Porto, Porto 1991 (vol. 1, pp. 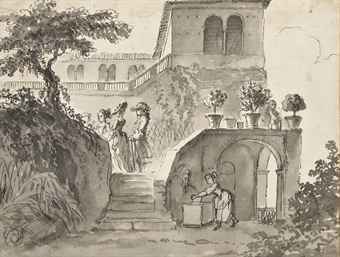 151-155), mentions two aquatints by John Cleveley the Younger (1747-1786), representing the Paço da Vila (Sintra National Palace). Araújo assumes that Cleveley was in Portugal in 1766 accompanying Joseph Banks, but there is no evidence to sustain this. As a marine painter, Cleveley also produced numerous drawings with views of the Tagus river, and the dates on the volume of thirty-seven drawings entitled Views round the Coast and on the River Tagus (Sotheby’s 17 Nov 1983, lot 51) place his visit to Portugal from August 1775 to January 1776 (information from: Bonhams). More works by Pierre Lélu can be seen at the Art Institute of Chicago, the British Museum, the Joconde database of artworks in French museums, and several related auction results are also available online. This entry was posted in Featured Artwork and tagged Alexandre Jean Noël, Clermont d'Amboise, John Cleveley the Younger, Penha Verde, periphery, Pierre Lélu, Sintra on October 28, 2014 by Foteini Vlachou.